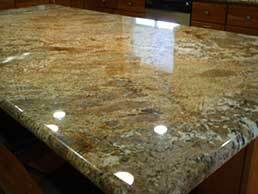 Ensuring the longevity of your granite, quartz or marble counter tops requires proper care. The daily removal of ordinary dirt and soil is an important phase in the maintenance of Granite. Sweeping compounds containing oil must never be used on marble because they will eventually discolor the surface. If floor is heavily trafficked it should be cleaned daily and rinsed with clean water until all traces of dirt solution are removed. Marble should then be allowed to dry. The care and cleaning of Granite products is quite simple, if the proper procedures are followed, products will maintain their natural beauty and durability for a lifetime. To ensure the best service from Granite products, clean the product thoroughly after installation, and follow up a regular maintenance program. Immediately after completing installation, wash the floor clean of loose debris, dirt and foreign material. Use clean, soft cloths, sponges or mops and fresh warm water. Allow to dry. A second rinse application may be required to remove any additional film. Apply a thin, even coat of sealer and allow to dry for 3-5 minutes, removing excess sealer before it dries. If too much of material is applied, it may be removed by re-applying sealer to re-activate residue, buffing it off before it dries. Finished area can be used for normal foot traffic in 3-5 hours, but must be kept dry and free of staining agents for 72 hours. The physical characteristics of Granite govern the methods of maintenance and the products chosen to treat and maintain it properly. Marble is a natural product of crystallized rock composed of calcium carbonate. Generally, Granite used in the interior of buildings for decorative purposes has either a polished finish (glossy surface reflecting light) or a honed one (dull and smooth surface giving relatively little reflection of light). Each of these types of marble finishes should be treated in the same manner. Why Does Granite Need Maintenance? Because marble is naturally porous, it is necessary to use a penetrating (not surface) sealer. Such penetrating products fill the pits and voids and actually become an integral part of the floor itself. The primary purpose of sealing is to provide protection to the Granite itself. Ordinary dirt and soil are sealed out of the floor as if all pits and voids have been filled and sealed. They are held on the surface where they can easily be removed. Marble floors properly sealed and finished are easy to clean and maintain. Granite floor should not be sealed until the surface is thoroughly cleaned and dried. Why Granite Should Be Kept Clean? The secret to beautiful marble is merely keeping it clean agents original treatment with sealer. Complicated cleaning agents and maintenance procedures will never be needed if the Granite surfaces are regularly cleaned. If marble deteriorates it is simply because it’s cleaning has been neglected or harsh damaging cleaners have been used. When Granite is neglected dirt and grease are allowed to accumulate, therefore the surface can be damaged almost beyond repair and cracks can be caused by general deterioration. Improper cleaning materials such as those containing alkali, acid metallic salts or other h2 ingredients actually attack the Granite itself and increase and enlarge dirt catching pores. Soap or abrasive type cleaners should never be used on Granite surfaces. This type of cleaner reacts with the calcium carbonate the marble itself to build a soapy scum which destroys the beauty of the Granite and forms a greasy or slippery film that will catch or hold dirt. The use of an abrasive cleaner will result in unsightly scratches on the surface. Abrasive cleaners are almost impossible to remove by rinsing and normal foot traffic will grind the left over abrasive particles into the surface, thus running the floor. The ideal cleaner should be first of all, effective in removing soil. Secondly, it should not develop any damaging discoloration or surface film. It should be rinsed free even in hard water. Use warm water, a mild or gentle dish soap and a washcloth or microfiber cloth for daily wipedowns. While well-sealed granite is relatively immune to bacteria, a 50/50 mix of water and 91% isopropyl alcohol will be a gentle disinfectant.